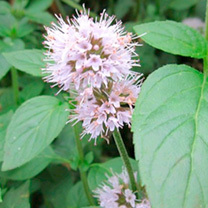 A strong mint scented herb, covered with pinkish-lilac flower heads. It used to be grown for its essential oils. This plant can be trimmed as required at any time during the growing season. Flowers July-October. Minimum height 30cm; maximum height 60cm. Maximum depth 20cm. Native, Fast growth rate. Available in two pot sizes: 3 x 9cm pots or 1 x 1 litre pot.